One of the most interesting material trends from the Surface Design show in London was the variety of new organic and sustainable materials.This 3D Wood by Emerging Objects is an example of how wood as a traditional material is changing at the moment. 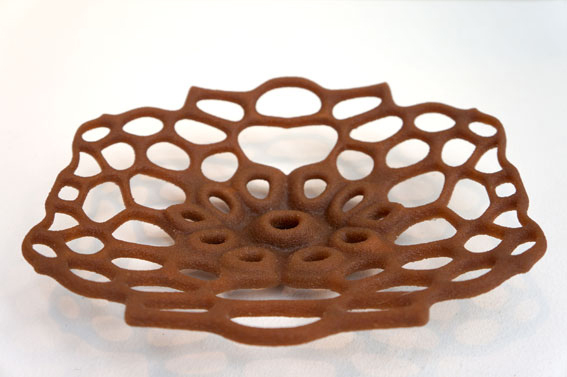 New aesthetics that are emerging from 3D printing are introduced to variety of different materials. Another trend was the increase of using waste materials in more sophisticated and inventive ways. This material composite is made of the bark of the trees. Overall the range of composite materials is growing and especially sustainable composites offer more and more variety. Though, it has been difficult to make any other design work out of that material because of strange surface. Interesting! I see more and more composites being developed at the moment. But it’s true that the surface can be an issue.